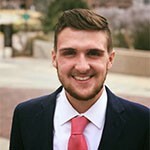 Jacob Murphy will be joining the Office of Student Activities on August 20 to serve as the new weekend and late night program coordinator. He recently completed his master’s of leadership for student affairs in higher education at University of Colorado, Colorado Springs, where he served as graduate assistant for student activities and programming in the Department of Student Life & Leadership. We are excited to have Jake focus his energy on our Pilots After Dark program, Campus Program Board, KDUP, and more. Please join us in welcoming Jake as he joins the Student Activities team later this month.